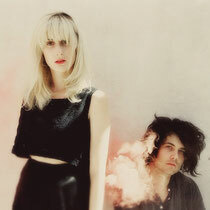 Brooklyn-based label Mexican Summer has announced that San Fransiscan Kiwi’s shoegaze duo Tamaryn will be returning to the UK in early 2013 for a string of live dates to support their newly released sophomore album 'Tender New Signs'. Following some stirring and positive reviews for second album 'Tender New Signs', Tamaryn have just announced a major European tour for early 2013, and will be stopping off in the UK for four of those dates. 'Tender New Signs' is available now via indie Brooklyn-based label Mexican Summer.